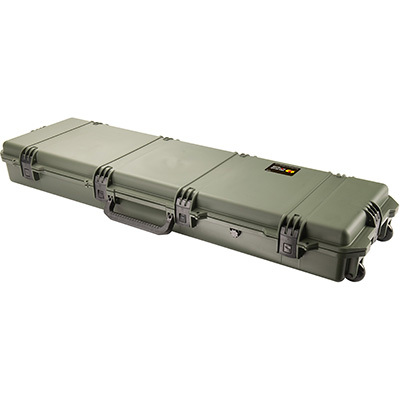 Injection molded Pelican™ Storm Case™ with HPX resin plastic body case with custom interior to hold (1) SCAR assault rifle (with or without scope), (1) grenade launcher, (1) spare barrel, (1) tool kit, (1) suppressor and (6-8) magazines with room for accessories. Airtight / Watertight case features automatic pressure equalization valve, (6) hinged push-button latches, (4) padlockable hasps, (2) extra wide padded handles with recessed inline wheels and waterproof O-ring gasket. Meets airline luggage regulations.